photo of my Happy Planner from this post! Hello finals season, we meet again. Being on the quarter system at UCLA means that I've already taken two sets of finals this year. It also means that my summer doesn't begin until we are well into June. To those on the semester system already enjoying summer, just know that I am currently so jealous! For those of us still in school, I have some end of school inspiration that will hopefully make finals a little more bearable. 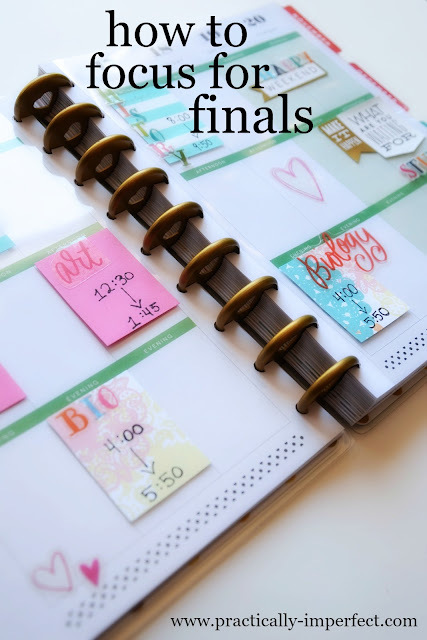 I've written about successful study tips before, but today I'm sharing how to conquer finals in the healthiest and happiest way! Playlists, to-do lists, and gratitude lists. There is no better feeling than prioritizing your goals and crossing off tasks. Each completed task leaves you feeling more positive, inspired, and motivated. Save your sanity by prioritizing more difficult tasks. Since you are more productive in the morning, get those done first. I work best on a deadline. Instead of tackling a huge project, break it into smaller parts and set a timer to complete those individual tasks. I think it is much less intimidating and much more rewarding this way. Little victories at a time lead to big success! Fuel up on inspiration by occasionally changing up your work environment. Many of the best ideas come in the least expected ways. This could mean ditching the library and working from an inspiring outdoor space, a busy coffee shop, or even from the floor of your dorm. Go to office throughout the course and before you start freaking out about the finals. Study with friends and compare your notes. You cannot get anything done unless you're taking care of your body and mind. Getting at least 8 hours a night allows your brain to fully recharge and stay focussed for the day ahead. Whether it's a quick workout, a Pinterest break, or making sure to eat foods that fuel your focus, take time to make personal wellness a priority. Wait, what? Have fun during finals? I have honestly learned the most when I've been having a great time. Last finals season, my friends and I used old study guides to make a few different games. By quizzing each other, we learned a lot and laughed a lot too.